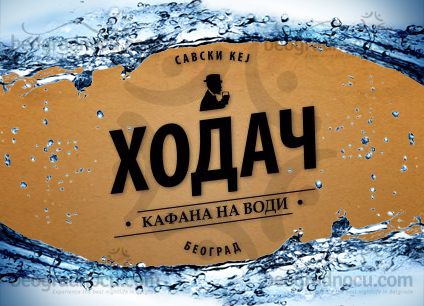 Tavern Hodač Na Vodi is located at Sava quay, most popular place for summer fun in Belgrade. Tavern Hodač Na Vodi changes night life of Belgrade which is their slogan and completely new concept of bohemian night life. Start a new season of bohemian lifestyle in tavern on water. Tavern Hodač Na Vodi is tavern with most beautiful view at Kalemegdan. This is one bohemian rhapsody on river that will offer you best party on river, wired musicians and true tavern ambient. Tavern Hodač Na Vodi is juncture of traditional and new. Plaid sheets are inevitable part of this place and of course homemade rakija, heaven nectar - draft beer. This is simply authentic style of tavern Hodač Na Vodi that everybody like. This tavern revives tradition of bohemians and time when tavern was institution. Prices are adjusted to your pocket, as it usually happens in tavern. Interior of tavern Hodač Na Vodi is genuine with soul and space for dancing in all night long. Wherever you are, you are always in center of attention, because every guest is special. Tavern Hodač Na Vodi nurtures national tradition and here every Thursday, Friday, Saturday or Sunday you can hear music. This is how will work your tavern Hodač Na Vodi. Tavern Hodač Na Vodi provides you a possibility of quality night life with traditional music, wide selection of drinks in beautiful interior. Here you can hear music for your soul, for every song and every note... These excellent musicians you can hear in tavern Hodač Na Vodi. But remember: ''Tavern is monument to free life and place of rebellion against mental imprisonment!'' Repeat this every time you come to tavern Hodač Na Vodi and life will be sweet. We promise you that. Tavern Hodač Na Vodi exudes with excellent atmosphere and it's intended for those who are seeking for good party. Make a reservation on time and spent pleasant time at river Sava in tavern Hodač Na Vodi. Change night life of Belgrade and spend time with the best! Tavern Hodač Na Vodi and their pleasant staff are waiting for you.